Standard Equipment: Four-cycle Briggs & Stratton air-cooled gasoline engine with "Oil Foam" air cleaner; 12-volt electrical system; electric starter-generator; magneto ignition; key ignition switch; push-button starting; controlled traction differential; 3 forward and I reverse speeds: drawbar; foot-operated clutch and brake; hinged foam rubber padded seat with arm and back rests; foot rest; implement lift system with left hand lift lever; 3 PTO outlets; 4:80 x 8 (2-ply) front tires; 23-8:50 x 12" rear tires; hinged seat; removable hood with hinged access console; painted yellow and black with cream trim wheels. Click the picture for a closer view. Bore and Stroke 3-1/16" X 3-1/4"
Height (at Hood Console) 37"
Height (at Steering Wheel) 33-3/4"
Height (at Hood line) 33-3/4"
SHIPPING WEIGHT (Approx.) 685 lbs. * Rated by Briggs & Stratton to the SAE J-607 Engine Test Standard. 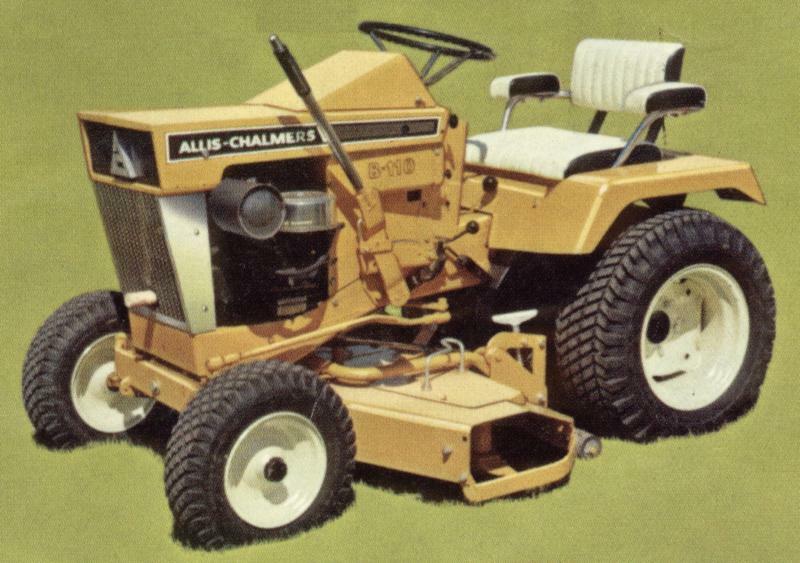 Allis-Chalmers reserves the right to make changes or improvements In the equipment described In these specifications at any time without notice or obligation.